We draw our inspiration from Torah’s central story of liberation, from the voices of prophets who courageously spoke truth to power, from the chutzpah of ancient rabbis who responded to the reality of exile with a vision of healing and righteousness and from countless generations of rebels, radicals, revolutionaries and rabble rousers – Jewish and non-Jewish alike – who challenged the status quo in order to create a better, fairer and more equitable world. We are an intentional congregation rooted in core values that guide the life of our community. 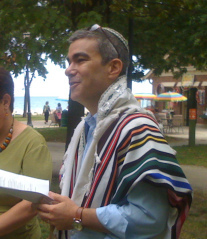 Rabbi Brant Rosen is Midwest Regional Director of the American Friends Service Committee, and formerly the rabbi of Jewish Reconstructionist Congregation in Evanston. He is the co-founder and co-chairperson of the Jewish Voice for Peace Rabbinical Council and a former president of the Reconstructionist Rabbinical Association. In 2009, he co-founded the Jewish Fast for Gaza with Rabbi Brian Walt. We are a 501c3 organization; most of our events are held at St. Luke’s Lutheran Church in Logan Square, 2837 W. Armitage Ave, Chicago.